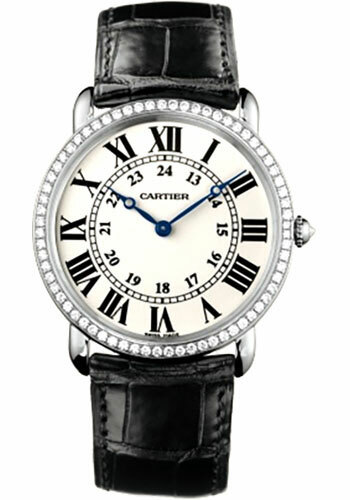 Large size, 18K white gold case set with diamonds, silver dial, manual winding mechanical movement, alligator strap with 18K gold deployant buckle. Water resistant to 30 meters (100 feet). 36 mm by 7 mm thick 18K white gold with rhodium finish case set with diamonds, 18K rhodiumized white gold beaded crown set with cut diamonds, sapphire crystal, silver dial with 18K rhodiumized white gold set with diamonds and blued steel apple shaped hands, caliber 430 MC manual movement, black alligator strap, 18K rhodiumized white gold set with diamonds buckle deployant. Water resistant to 30 meters.